This year, Russia agreed to supply Belarus with discounted oil only for the next six months, rather than for the whole year. The size and conditions for further shipments will depend on Belarus’ participation in specific integration projects and the sale of several companies to Russia. All of this shows how the Kremlin uses Belarus' energy dependence to get what it wants. Energy remains an area in which Russia has a very strong position in Belarus. Russia dominates the nation's gas infrastructure, oversees the work of its oil refineries and has significant influence on its electrical industry. Although the building of a nuclear power plant looks economically beneficial, Russia`s control over the project, combined with Belarus' doubtful ability to repay the accompanying $9bn loan, raises many questions. Currently, Russia is not using all of its energy potential to blackmail Belarus. Kremlin has possibilities to bankrupt not only individual Belarusian enterprises, but also the entire country. The Russian energy needle will remain a significant factor in the geopolitical choice of Belarus today and even after Lukashenka`s reign. Russia almost completely controls the gas infrastructure of Belarus. Gazprom is the sole supplier of gas to Belarus, a Russian monopoly has controlled the Yamal transit pipeline since its inception, and after the acquisition of Beltransgaz, Gazprom owns almost all the pipeline in Belarus. Beltopgas, a small state-owned enterprise, which is primarily engaged in the production of peat, remains in charge of small gas supplies. Although Gazprom became a monopoly in Belarus, it is not pushing prices higher. 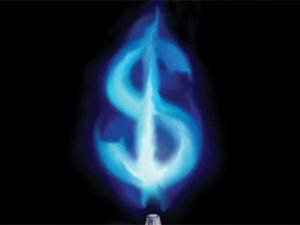 Belarus receives natural gas cheaper than any other country in Europe. In 2014 Belarus pays only $ 167 per thousand m3. Russia at present does not use its full control over the gas infrastructure for political or economic blackmail, although it remains possible in the future. Under the current conditions, Gazprom can arbitrarily change the prices, which could force some enterprises to go bankrupt or perhaps even the whole country. The Russian monopoly has its finger on the gas artery of Belarus and at any moment can click on it to implement Russian interests in Belarus. Gazprom remains the pioneer of Russian big business in Belarus. The Russian monopoly has been steadily upgrading the Belarusian gas transportation system, investing in the banking sector, raising the salaries of Belarusian employees. The corporation conveys a simple message from the Russian government to Belarusian society: selling Belarusian enterprises leads to better welfare. Belarus' dependence on Russia in the oil industry remains less significant that in case of natural gas. Although Russia is the only supplier of oil to Belarus right now, the oil infrastructure belongs predominantly to Belarus. As in the case of gas, Russia decides how much and at what price to deliver raw materials to Belarus depending on the state of their relations. The Belarusian state independently controls the Navapolatsk refinery and has a majority stake in a refinery in Mazyr. Russian company Slavneft, controlled by GazpromNeft and Rosneft, owns 42.58% of the shares of the Mazyr refinery. Part of the Druzhba pipeline, which goes through the territory of Belarus, remains under control of the Belarusian authorities. Annually, Russia delivers enormous volumes of oil to Belarus. In the first half of 2014, Russia will supply 11.5 million tonnes of crude oil to Belarusian refineries. At the moment the parties have not announced the price of oil, but certainly this price will be sufficient to ensure the functioning of the most profitable Belarusian companies in 2013 - Mazyr and Navapolatsk plants. The Kremlin wants to achieve the same position in the oil industry as in gas - to take control of the entire oil infrastructure of Belarus. It is a rather straightforward position to hold as only Russian shipments to Belarusian refineries remain economically meaningful. In 2010-2012 Belarus bought oil from Venezuela, though it was not very economically feasible nor did it make economic sense, even though it became a big challenge for Russia. In 2010, the period of dialogue with the West and during its strained relations with Russia, the Belarusian authorities adopted a strategy for developing the energy potential of the Republic of Belarus. This strategy aimed at modernising the antiquated energy sector and diversify its energy supply away from Russia. However, the strategy proved to lack any economic commonsense, and therefore the authorities refused to implement it. Belarus has several wind turbines and 49 hydropower plants throughout the country, but they do not play a significant role in the energy security of Belarus. Belarusian officials do not know how to talk to businessmen and this further increases Belarusian dependence on Russia. German firm Enertrag planned to build a wind energy park near Minsk Park, an investment that would have been about € 360 million. When the firm had already spent about € 300 thousand, authorities abandoned the project, justifying backing out due to the potential barriers of a military radar that was located nearby. Belarus has the necessary infrastructure to provide itself with electric power. However, Belarus creates electrical energy primarily by burning gas. This means that in this area Belarus' opportunities to achieve greater energy independence remain quite feeble. Belarus imports a small portion of its electricity from Russia and other countries. In a bizarre incident, in 2009 the Russian authorities claimed that the unauthorised transit of the electricity produced in third-party countries for Belarus was going through the territory of Russia. Unfortunately, the Kremlin did not disclose any of the details of these cases and no more information has been made public. Constructing a nuclear reactor using Russian specialists on Russian money still cannot help provide energy to all of Belarus, but at the moment remains the only chance Belarus has to diversify its energy supplies. At the same time the results of the agreements signed by Russia and Belarus gave the Kremlin control over the export of energy created in the Astraviets Nuclear Power Plant. Energoconnect, the Belarusian-Russian joint venture, oversees the export of Belarusian electricity. Although the Belarusian economy remains interested in the construction of the nuclear power plant, the authorities still face a problem with repaying a $ 9bn loan that it has received from Russia for the construction of the plant. The absence of energy independence has left Belarus in limbo. Even if pro-Western politicians come to power, they will be forced to reckon with their dependence on Russia in such a sensitive area as energy. There is no doubt that in case of the elites’ desire to bring Belarus closer to the EU, Russia will fully use its energy potential for blackmail. Belarus will have serious problems getting off of Russia's energy needle.